Fast Company had an excellent article on the growth in visual resumes using graphic design templates and, presumably, oversight from graphic designers. Making something look cool, and bespoke, gives the content the ‘feel’ of quality. HR commentators on the Fast Co. article made the point that resume software in large corporations cannot interrogate ‘design work’ – they are parsing words via OCR software tools. Yeah. But. Creating personal branding pzazz is not about computer software. It is about reaching into the extended network and making human connections. So, if you are applying for one of those jobs, then the degree from Harvard is what you need. But if you are trying to make a connection – human to human – do not under-estimate the power of design thinking. 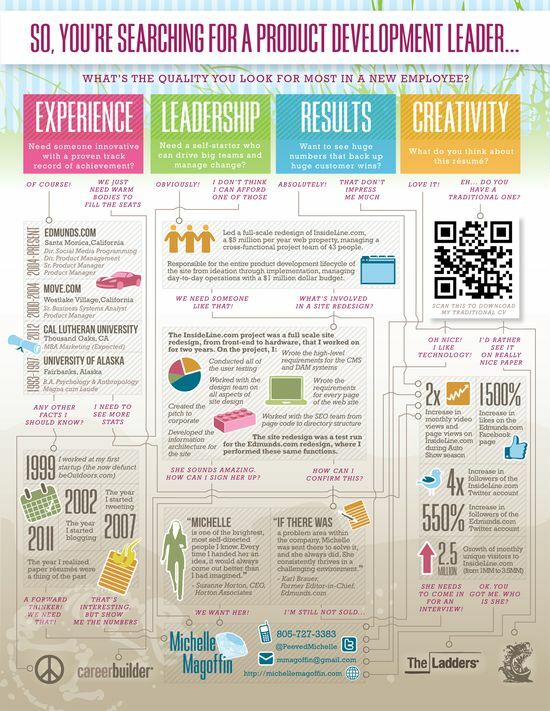 The best method to investigate good examples of resume infographics – or infographic resules – is via pinterest. Search for infographic resumes, natch. Business Insider had a few good examples. Fun: more than a bland-o CV, that’s for sure. Revealing: design decisions are similar to word choice in revealing your style. Entertaining: colour choices, font, columns, header hooks – plenty of pzazz available. Heartfelt: it depends. Looking + reading = good; but design can be used to fake it too. It is narrative in nature, which is the topic for the next post.